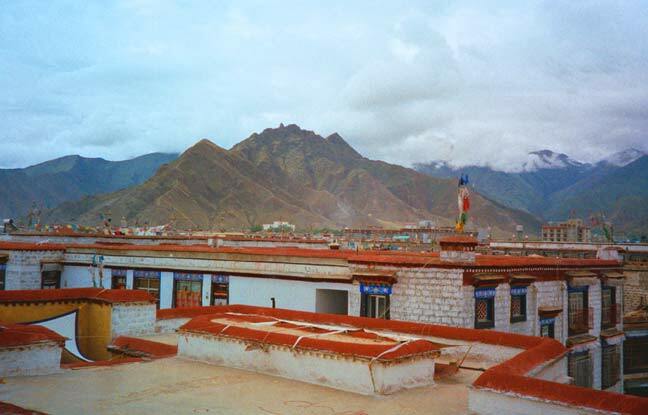 Lhasa and the surrounding mountains viewed from the roof of the Jorkang Temple. Ornate door at the Potala Palace. Distinctive doorway on the lower level of the Potala Palace. Part of our group with our guide, Kunchok, at an inner court yard at Gelupga Monastery. Part of our group in Junr 2004 at an upper level in the Potala Palace in Lhasa. Door way at the Potala with richly appliqued fabric.